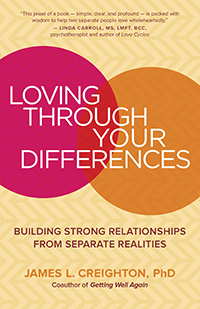 Psychologist and relationship consultant James Creighton wrote his new book, Loving through Your Differences: Building Strong Relationships from Separate Realities, to help reduce conflict between couples, especially conflict that is based on different perceptions or experiences of reality. The book’s primary aim is to empower couples with the knowledge and practical skills they need to choose to live happily and productively together, finding excitement and fulfillment, rather than disappointment and frustration, in their differences. We hope you’ll enjoy this excerpt from the book. When we get close to another person, we quickly discover that their emotional reality is not exactly like ours. At this point, a struggle often begins over who is “right.” Arguments over whose emotional reality is right are often particularly painful and long lasting. Ron’s wife, Priscilla, was raised in a very close family, where feelings were expressed openly, if sometimes loudly. The role of family members was seen as “improving” each other, helping them to be more successful in life, rather than blindly defending and protecting each other. The shared family belief was, “If you love me, you will give me constructive feedback about my mistakes, and I will try to improve myself. I will show my love for you by giving you constructive feedback whenever I think you can profit from it.” This behavior also extended to others: as friends came to be thought of as part of the family, they too would receive criticism. During their courtship, Ron was attracted to Priscilla because she was warm and expressive, while she liked him because he seemed very self-reliant and independent. This was particularly important to her because she found it hard to break away from her family, often feeling pulled and torn by their demands. But now, after a few years of marriage, Ron and Priscilla both feel hurt and rejected. When Priscilla engages in what she believes to be loving behavior — pointing out how Ron might be more successful at work, or why the kids do not pay more attention to him — he responds as if he has been attacked. Ron experiences her attempts at constructive criticism as attempts to undermine and hurt him. In particular, if she criticizes him in front of close friends, he feels embarrassed and betrayed. Priscilla feels hurt and rejected because anytime she tries to be loving and supportive, by pointing out ways that Ron could improve, he reacts as if she were cruel and mean. She also is beginning to worry that Ron does not really love her, because he fails to support her by showing her how she could improve. Because Ron and Priscilla accept beliefs instilled in them by their families, their efforts to express love are at cross-purposes. Both of them act in ways they believe are loving, but each sees the other as unloving. This conflict rests on two fundamentally different understandings of what it means to tell a partner about shortcomings. Ron believes that Priscilla’s habit of correcting his shortcomings is hurtful criticism, undermining him and making him feel unloved. He also believes that criticism fundamentally threatens the security of the relationship. Priscilla, on the other hand, believes that correcting Ron’s shortcomings is a sign of how much she loves him. When Ron won’t correct her own shortcomings, she interprets his behavior as a sign that he doesn’t care about her. Ron and Priscilla learned these beliefs in their families of origin. Questioning these beliefs is seen as criticizing or even rejecting each other’s families. This is not a disagreement that is going to end quickly. It won’t be resolved by trying to prove who is right. How could Ron and Priscilla deal with their differences without the estrangement or sense of distance caused by this fight? How can you build a shared life when there are such differences? The solution lies in employing a new style of communication that respects the partners’ separate emotional realities, allowing each to maintain the integrity of their individual truths and to express their own reality without fear. It follows eleven guidelines that are the basis for the rest of this book and that will help you see your differences as a teacher rather than as a source of conflict. 1. Agree that each person has a right to his or her way of seeing and experiencing things (his or her emotional reality) while affirming and trusting your own. Each of you respects the other’s emotional reality, rather than defending your own point of view as the only truth. As long as you are fighting over who is right, or labeling each other as irrational, misguided, or emotionally disturbed, nothing can come from the conflict except more conflict. Your feelings are valid and a part of your own truth, but those feelings can change quickly if you gain a new understanding of the events that led to those feelings. The starting point is to accept it as a fact that two people can experience the same event in very different ways. Accept it as a fact that the other person’s feelings make perfect sense within their emotional reality — within their life experiences — and that this is okay. While many of us accept these principles in our heads, most of us still have difficulty accepting them in our hearts. 2. Communicate your own reality without finding fault with other people’s. Our interpretations may be 100 percent right for us even while being largely unworkable for others. We choose how we see reality, but we need not insist that others see it the same way. We can give up the belief that having other people agree with us is a test of love and give up the fear that when others see things differently, it’s a sign that they don’t love us. 3. Listen — with both your head and your heart — even though you may continue to disagree. When we are engaged in conflict with someone who has a very different emotional reality, there is a tendency to feel threatened or fearful. We begin to see the other person as an alien and as an abstraction; this view is often expressed in phrases such as “You’re always doing that” or “That’s just like a man to do that!” This may escalate into seeing the other person as an aggressor, out to get us, filled with evil motives. When we begin to see the other person as an adversary or even as an enemy, we engage in behavior that makes this belief a self-fulfilling prophecy. As our vision narrows and we see only undesirable traits in the other person, our behavior encourages those undesirable traits in them. Often we believe our pain is proof that the other person is the cruel adversary we have created in our own mind’s eye. In fact, this creature is of our own creation. There is another possible path: practicing empathy. Empathy is the ability to experience — at least to some degree — what the other person is experiencing. This can help you understand how it would feel to be in the other person’s reality. It doesn’t mean that you take the other person’s position; you are simply allowing yourself to experience what it would be like to do so. Empathy allows us to enter into the emotional reality of our loved ones, so that even when there are differences there is still shared experience. 4. Learn to identify behaviors that cause fights to escalate, and set mutually acceptable rules to limit these behaviors. Fights, particularly between couples, can start over the silliest of things. Sadly, these squabbles can escalate to the point where both people feel hurt, angry, and rejected. Fights don’t blow out of control all by themselves. They escalate because of the behaviors in which both parties engage. There is even a predictable pattern to escalation. Each person is justifying their own behavior as just getting even for what the other person said or did. That really means that neither person is taking responsibility for their own behavior. Many people try to solve problems starting with the belief that their partner is the barrier to solving the problem. The chances of finding a mutually acceptable solution will be very limited if each sees the other as an opponent. By changing the basis of the discussion to “We have a problem,” a couple can greatly expand the range of alternative solutions they can consider. 6. Look for the positive good that your partner supports, even when your partner opposes what you think is important. Most of the really tough decisions in life are not choices between good and bad but between two good things that compete or are in tension with each other. Accepting a promotion in another city, for example, may help you financially and further your career, but these benefits come at the price of close relationships you and your children have built in the community where you live now. Career advancement is good, but so are the relationships you’ve built. That’s what makes many decisions difficult: you have to decide which good thing is more important than other good things. The real decision is which choice is most important in a particular situation. Usually we agree on the things that are good, but we disagree about the relative weight or importance to give them. These choices are called values choices, because they involve trade-offs between different things that we value. They often arise over decisions about spending money. What value should be given to things we can enjoy now, and what value to saving up for the future? Is it worthwhile to spend money on a fancy car, or should we spend only enough money for a car that is serviceable? Many of the conflicts between couples involve exactly this kind of decision-making. Our preferred choices reflect the values that we think are most important in a given situation. Each decision requires balancing two or more goods. When we argue about what action to take, we frequently see our partner as someone who opposes what we believe to be right; conversely, the partner may feel that we are discounting the value and importance of a different choice. The key principle for dealing with values differences is to recognize that your partner is not opposing you but simply giving different relative weights to values you both support. 7. Seek out new ways of perceiving reality you can both agree on. When we are faced with external facts, we interpret the facts, and we do so in a context that we create ourselves. We “frame” the situation through our deeply held beliefs and assumptions. Old ways of framing our experiences may place us under unnecessary constraints. They can prevent us from exploring and using our own abilities to our best advantage. They may even be responsible for the impasse between partners with different emotional realities. If you and your partner have a continuing struggle, you may be able to break the impasse by reframing the situation, finding alternative ways of understanding it that can accommodate both partners’ emotional realities. 8. Reframe your life story as needed to create options and free up capabilities. One way to change your life is to revise the story you tell yourself about it. By looking for past events that contradict the way you think about your life now, you may be able to reclaim parts of yourself and craft a new story that accommodates both your emotional reality and your partner’s. You may find that you can act in ways that you never imagined possible. 9. Examine your self-talk to be sure it is serving you well, and reprogram it when you need to. We all have an inner voice that comments on what we are doing, favorably or otherwise. Psychologists refer to this inner dialogue as self-talk. We learn most of our self-talk as children, from parents and other adults. Some self-talk serves us well, and some of it imposes constraints on our behavior that don’t serve us as adults. A great deal of this self-talk is negative. Changing your negative self-talk is a powerful way of changing your beliefs about yourself, including your attitudes to and behaviors around conflict. 10. Get to know the different parts of your personality and get them talking to each other. Resolving disputes over differing emotional realities involves learning to recognize these different parts of ourselves and noticing which one is in charge at any given time. In chapter 14 we explore the dynamics of personality that may be the basis for why we have the particular emotional reality we have, and why we feel the need to defend it the way we do. 11. Accept that differences can make your relationships richer. Our differences with another person become teachers when we see ourselves, individually and as a couple, as being on a search for truth. Along the way you may discover truths, but no human being yet knows “the Truth.” Sharing the search, even when you face differences, can strengthen your relationship. One of the great rewards of this joint search is that the other person may possess a truth that can improve the quality of your life as you incorporate it into your own truth. Look for principles or new ways of perceiving reality that are large enough to contain both people’s versions of the truth. Finally, end the struggle when you are able to agree on a new, shared version of the truth — “our” truth. In this way you honor both your own truth and the truth of your partner. You’ve used your differences as a teacher, leading you to a deeper mutual understanding and richer love. James L. Creighton, PhD, is the author of Loving through Your Differences and several other books. He has worked with couples and conducted communications training for nearly fifty years around the world. Visit him online at www.jameslcreighton.com. Excerpted from the book Loving through Your Differences. Copyright © 2019 by James L. Creighton, PhD.